Awhile back I wrote that the origin story of the name of Seattle’s Beacon Hill made no sense. Well, first of all, the story changed with each author. And then none of them made sense. In 1916’s History of Seattle, Bagley erroneously listed M. H. Young as one of the founders of the Union Trunk Line. Bagley said, “On November 10, 1891, the Union Trunk Line was organized by J. D. Lowman, M. H. Young, E. H. Wittler and associates.” The date is wrong. Wittler and Lowman along with a host of other important Seattle men funded, built and operated the Trunk Line. But, Young doesn’t enter the UTL paper trail until 1893. So we can’t trust Bagley. M. H. Young did not build a streetcar line connecting Beacon Hill to downtown. But did he really name Beacon Hill? In short, I could refute every statement in each origin story except whether Marcellus Harwood Young named Beacon Hill. I went on to say that the only possibility I could see was that the company Young represented, the New England & Northwestern Improvement Company, could have owned a major chunk of Beacon Hill and lent money to the streetcar company that ran its line to the hill. If that was true, and the streetcar renamed the hill, maybe Young played a role. Otherwise this story about Young naming Beacon Hill is complete nonsense. In November 2014 the entire Victorian era run of the Seattle PI – from 1871 to 1899 – was published for free access through the Library of Congress’ Chronicling America newspaper portal. After searching for my family history (umm, my great, great grandmother sued for divorce because of “personal indignities and his refusal to support his family by abandoning her and consorting with lewd women“), I remembered the unanswered questions about Beacon Hill’s origins. Could I determine the source? The first occurrence of “Beacon hill” to refer to that land mass south of Dearborn Street appeared in 1889. After the fire there was a long proposal by H. H. Dearborn — some of which was eventually adopted — to rename the streets of Seattle, renumber some blocks, and renumber the piers to make the city make sense. After a series of annexations there were odd issues from reused street names, and King County had never ensured that plat street names matched neighboring plats. Stupidity reigned, for example Norman B. Judkins’ Addition to the Town of Seattle had streets named Norman, B, Judkins, Addition, Town and Seattle (some of which still exist). 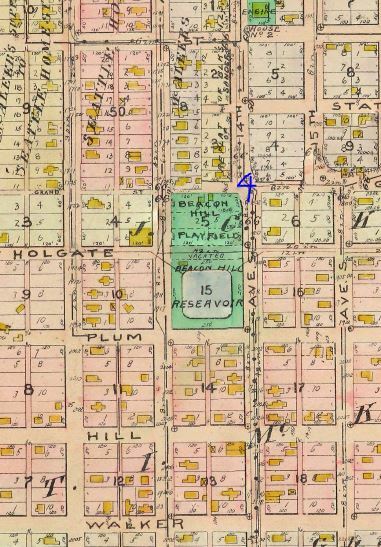 Syndicate Hill name derived from the Syndicate Addition plat (1 on the map below) of 1884, filed by Howard H. Lewis. Within that plat an area was set aside for Syndicate Ridge and Syndicate Hill. The hill was the southwestern half of the block between Lane, Dearborn, 10th and 12th cut diagonally. The ridge was the entire block that would later house the South School as well as the other half of the block with the hill. The block with the hill was later platted as the Beacon Place Addition, discussed later (3 on the map). This is now an empty lot on a steep slope down to Dearborn. The reservoir refers to a Spring Hill Water Company reservoir built on the block between Plum, Holgate, 13th and 14th in 1886. This is now Beacon Hill Playground. (4 on the second map). Zoom of 1912 Baist map from Paul Dorpat. Piece of 1912 Baist from Paul Dorpat. The origin of the name “Syndicate” is not clear to me, but Lewis was later involved in a “Terminal Syndicate Company” with J. F. McNaught, H. W. McNeill, A. W. Engle, and Rufus H. Smith. Probably the name of the addition was derived from something like that. “Spring Hill” name came from the fact that so much water could be tapped from what we call Beacon Hill and the ridge to First Hill. “Beacon Hill” was a high-class neighborhood name taken from Boston. In 1889 it was used in advertising in Seattle to refer to the Renton Hill Addition (roughly east of 12th, south of Madison) as the “Beacon hill of Seattle”. Newcomers would automatically have a positive image if a neighborhood were truly named Beacon Hill. So, to be clear: H. H. Dearborn has the first published occurrence of the name Beacon Hill that I can find, October 1889. It referred to roughly Charles to Holgate. Dearborn’s idea for Beacon Hill didn’t stick immediately. But in Nov 1890 Edward F. Wittler drew up a plat for the Beacon Place Addition. This took the formerly subdivided, unplatted block of the Syndicate Addition and created a nice park surrounded by home plats. (3 on the map above) It was approved in October 1891. Wittler arrived in Seattle in 1888 in retirement, and quickly put his capital to work. 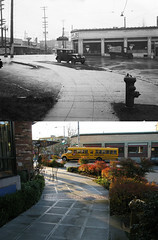 He was involved in the Mill Street (Yesler) Cable and development plans along it. He was then responsible for filing the franchise request for the Union Trunk Lines. In the Spring of 1891 the UTL ran a streetcar along a ridge right where the 12th Avenue South (Jose Rizal) Bridge is today. It ran right past Wittler’s Beacon Place Addition. Discussion of that streetcar line changed suddenly in April 1891. Previously it was described as “the southern line” in February and March. In an April 26 article (column 3 “Work on the Trunk Lines”) the PI said “The track of the Union Trunk Lines over Beacon hill is ready for operation on both sides of the slide in front of the South school.” It’s unclear if this is referring only to the Syndicate Hill / Beacon Place area as Beacon Hill, or to the full length of the streetcar south to the city limits at Hanford Street. I suspect the former. By June, Union Trunk Line executive and realtor Fred Sander was running real estate ads for a variety of parcels along the southern route on what he called Beacon Hill. These included ads for Beacon Place. On May 31, 1891 the cars of the Union Trunk Line began running to the south terminus and they already were painted with destinations “Occidental Park, James Street & Beacon Hill“. I assume that like later streetcars that referred to a development or neighborhood as their destination, Sander and Wittler were truly referring to their Beacon Place development and the former Syndicate Hill when they wrote “Beacon Hill” on the streetcars. At some later time this began to refer to the entirety of the streetcar route. When the Jackson ridge was cut away around 1910 suddenly there was truly a hill facing downtown Seattle. That must have triggered the use of Beacon Hill to describe all of the land mass between the Rainier Valley and former tidelands. I found a few articles that mentioned M. H. Young in context of Beacon Hill. This indicates that the common name for the area we term North Beacon Hill (plus areas that were dropped by the Dearborn Regrade) was Reservoir Hill. Presumably this name arose in 1886 with the construction of the large reservoir at Holgate. The Victorian Seattle Post-Intelligencer does not state who came up with the name “Beacon Hill”. However, H. H. Dearborn had the first printed suggestion to use it in 1889. Edward Wittler filed the Beacon Place plat, the first documented connection to Beacon Hill in 1890. Dearborn seemed to give him credit for formally attaching the name to the neighborhood and putting it on streetcars. Fred Sander popularized the name in ads. Wittler and Sander also popularized it through the route of their streetcar in 1891. M. H. Young was present, but not a key player in the Union Trunk Line (not until after the 1893 financial panic). He did own property in the key zone of what was initially named Beacon Hill, and built his home there. I believe he had the opportunity to suggest the name to the above mentioned men. The stories of Young have so many inaccuracies, though, that I can’t give him credit for the name until I find hard, contemporary evidence.